Technical Writer, Khidr Suleman attended a cross-government API Standards event at the end of October. The event provided an opportunity to discuss how to promote common principles of API design to make them easy to implement across government. 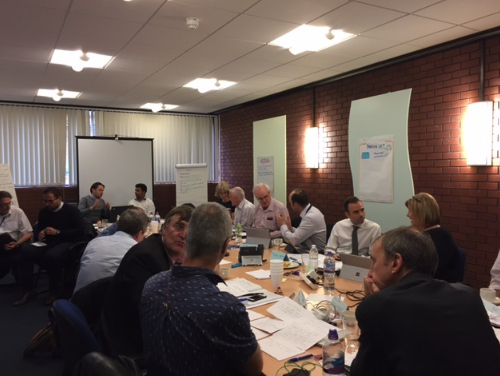 A total of 20 attendees from government (both central and local) and industry attended the API event we held in Birmingham. GDS put on the event with iStandUK and it was hosted by the Department of Work and Pensions (DWP). We invited iNetwork to chair the workshop as a neutral body. Paul Davidson from Sedgemoor District Council and iStandUK started the day by presenting the user need for API standards. The government is increasingly using APIs to automate processes and provide citizens with access to new services. Local government is also a big API consumer because of its need to share data with central departments. Currently, departments are developing APIs using different tools, platforms and approaches. Creating API standards will make integration simpler and faster. Peter Chamberlin, GDS Technical Architect, talked through the API standards guidance currently in draft and being reviewed by departments. DWP and HMRC rounded off the morning presentations with a show and tell on some of the latest APIs they had been developing, including the HMRC Developer Hub. The afternoon session consisted of interactive workshops. Industry representatives from Civica, Capita, Northgate and TechUK, suggested the need for API consistency and governance. A draft version of the GDS API standards guidance was shared with attendees and they were invited to peer review the document. To support the understanding and implementation of the guidance they suggested it should be promoted through working groups, forums and events such as iNetwork and Open Data Camp. Much of the data shared within government is sensitive, and several attendees highlighted patterns for authorising access to data over APIs as an area for further discussion. Central government must protect user data and make sure the appropriate controls are in place. The challenge is making sure securing APIs is not complicated to the detriment of usability. Bringing the government together with suppliers to talk about APIs was a positive start. The aim is to build on this working group and share knowledge so all organisations involved can contribute to solving the challenges identified. GDS is hosting another event with central government attendees in February to discuss potential solutions to these challenges. The working group will then feedback to local authorities in the new year.